Many businesses make wise preparations for the possibility of a partner becoming disabled by funding their buy/sell agreements with Buy/Sell Disability Insurance plans. Most look to insure against premature death, but a disability occurring before retirement is actually far more likely. If we look at most plan’s terms, we have to ask, “What can happen to a company’s cash flow during it’s buy/sell plan’s elimination period, which is typically 12 months or longer, while the disabled partner is unable to work?” A financial bleed can follow the loss of a key employee or principal due to a disability for many reasons. An electronics manufacturing corporation with two partners; Mrs. Adams, the engineer, and Mr. Johnson, the salesperson. There is a buy/sell agreement in place to protect the interest of each principal if a disability occurs. The agreement states that in the event of a partner becoming permanently and totally disabled, the remaining partner must buy out the disabled partner’s share of the company. This firm has become quite prosperous and is now worth $5 million, so rather than a principal having to write a $2.5 million check to their disabled partner, they have wisely chosen to fund the agreement with Buy/Sell Disability Insurance. They feel reassured that they have adequately protected themselves and their business. When Mrs. Adams became disabled, this young firm fell immediately into financial distress as their product development came to a screeching halt. Mr. Johnson had to try to rework deals made with distributors and retailers in addition to trying to find and hire a replacement to keep the development side of the business moving forward. If they had only purchased a Buy/Sell PLUS disability insurance plan, the key person monthly benefit would have provided a cash flow to offset these financial setbacks. The Buy/Sell PLUS plan alleviates the concern that this scenario presents and makes the task of buying different business coverages a much easier matter. Our newly designed Buy/Sell PLUS plan offers the solution to this worry by providing a key person disability monthly benefit of up to $50,000 to the firm following a standard 90 day elimination period. 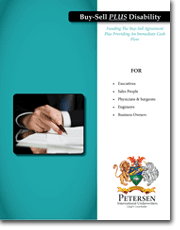 This benefit can compensate for the business’s cash flow deficiency and can be used in any way the firm sees fit. The term of the key person portion of the policy is dependent upon the length of the buy/sell elimination period, thus the key person benefit ends when the buy/sell benefit becomes payable. More than the combination sale of two products, the Buy/Sell PLUS plan is an amalgamation of insurance protection for both businesses and business owners over the short and long term.